Victoria Coach Station is the largest coach station in London, located in the central district of Victoria in the City of Westminster. It serves as a terminus for many medium- and long-distance coach services in the United Kingdom, and is also the departure point for many countryside coach tours originating from London. 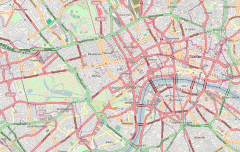 It is operated by Victoria Coach Station Limited, a subsidiary of Transport for London (TfL).. The station reports 14,000,000 passengers with 472,000 individual coach arrivals or departures. The station passenger numbers have risen in the 10 years (2008 to 2018) by 47% from 9.5 million (2008) to 14 million (2018). Coach numbers have risen by 20% over the same period - from 394,000 (2008) to 472,000 (2018). ^ "Coach companies - Transport for London". Retrieved 25 May 2015.